According to OpenSecrets.org, Casey’s campaign and leadership PAC took in more than $114,000 from Comcast during the 2014 election cycle alone. 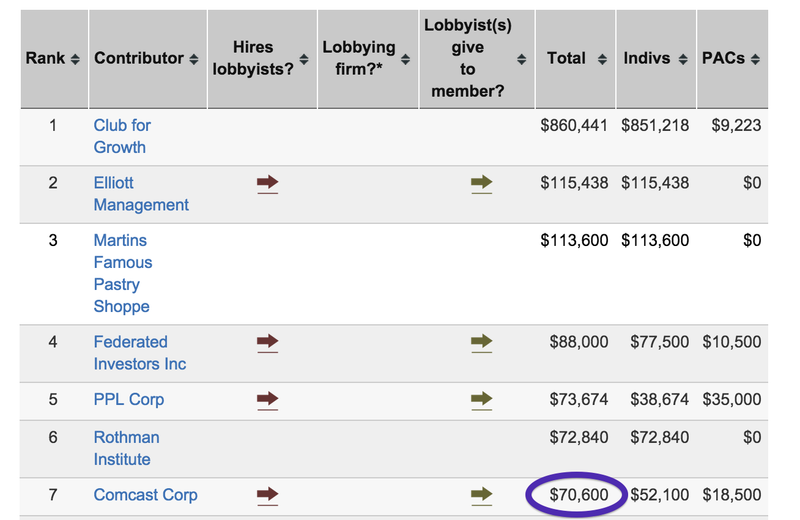 The cable colossus was the Pennsylvania Senator’s top contributor. Earlier today, the two U.S. Senators from Pennsylvania put aside partisan squabbling for a moment to agree that the only things more awesome than campaign contributions from Comcast are the things Comcast has told us are really cool about its pending merger with Time Warner Cable. Their reasons? Because Comcast informed them that it’s a good deal. Oh, but the good lawmakers aren’t done parroting what their Philadelphia-based benefactor has told them about the merger. Comcast was only the seventh-largest contributor to Toomey’s campaign fund and leadership PAC, but still gave more than $70K in 2014. Click image to read. What the senators actually mean by “Comcast acted proactively to prevent anti-competitive effects,” is that the cable industry has spent decades enjoying regional monopolies wherein there generally no competition for pay-TV providers and little-to-no competition for broadband services. Toomey should actually know this, since he currently lives in Zionsville, PA, which is not in the current footprint of Comcast and won’t ever be unless Comcast decides to buy up the small regional provider who controls pay-TV service in the area. Perhaps that’s why he’s relying so much on things that Comcast has “informed” him about rather than taking a few minutes to do his own research. And if we may just call shenanigans on the concluding points of the Senators’ letter, which doesn’t cite Comcast as the source, but which makes statements that neither Toomey nor Casey can back up. It says the merger will benefit “workers through additional jobs,” but doesn’t explain how that’s possible, given that the whole notion of the merger is to cut down on Comcast’s marginal costs. There is no way on Earth that a combined Comcast/TWC — especially one that sheds 3 million customers to placate regulators — will maintain the same number of customer service and billing staff. Additionally, there will inevitably be jobs lost or eliminated through attrition as Comcast consolidates its broadcasting and broadband operations. The senators claim that the merger will benefit “millions of consumers through faster Internet speeds,” but doesn’t show any evidence that Comcast actually wants to provide faster speeds for consumers. In fact, Comcast is actively testing out broadband caps, implying that it wants to limit the amount of data its subscribers use. Then it argues, again without any evidence, that the public at large will benefit from the expansion of Comcast Internet Essentials, a program — largely derided as window-dressing to appease regulators — aimed at giving broadband access to certain low-income families. But Comcast, years into the rollout of Essentials, has by its own admission only signed up 350,000 households, a fraction of the more than 20 million customers it has around the country. The Comcast merger is only a good deal for Comcast investors and the Time Warner Cable executives who stand to get paid a ton of money for running a mediocre company, like CEO Rob Marcus, who personally stands to rake in upwards of $80 million, even though he’s really been a lame duck for his entire tenure on the job. In fact, it might be better for lawmakers to quietly do what they can to make sure this merger fails. That way, they can score some big contributions from Charter when it then tries to take over TWC.